Fall, 2018 Gospel Meeting Recordings Of Kevin Presley Added! We just completed the additions of Kevin Presley’s 2018 gospel meeting at Pleasant View to the website for you to listen to and share. You can find them in the ‘Audio Recordings’ tab above. The meeting was a great success and we look forward to having this fine preacher of the Gospel come see us again very soon. We were very encouraged by the support shown for the meeting by many members from surrounding congregations, as well as people visiting from the community for nearly every service! These lessons are both powerful and relevant to the time that we live in while staying true to what the scriptures have always told us through the ages. In this series of lessons, Brother Kevin took on several interesting topics that will engage you and help strengthen your faith. We hope that you enjoy the recordings and only ask that if you download and distribute (which is why these are here) that you would please, as with all of our posted recordings, credit the preacher somewhere in the meta-data or in the file name. Thanks for stopping by and we would love to see you in person on the Lord’s day if you are ever in the Springfield, MO area! Spring, 2018 Gospel Meeting Recordings Of Jimmy Cating Added! We just completed the additions of Jimmy Cating’s 2018 gospel meeting at Pleasant View to the website for you to listen to and share. You can find them in the ‘Audio Recordings’ tab above. The meeting was a great success and we look forward to having this fine preacher of the Gospel come see us again very soon. We were very encouraged by the support shown for the meeting by many members from surrounding congregations, as well as people visiting from the community for nearly every service! These lessons are both powerful and relevant to the time that we live in while staying true to what the scriptures have always told us through the ages. In this series of lessons, Brother Jimmy took on several interesting topics that will engage you and help strengthen your faith. We hope that you enjoy the recordings and only ask that if you download and distribute (which is why these are here) that you would please, as with all of our posted recordings, credit the preacher somewhere in the meta-data or in the file name. Thanks for stopping by and we would love to see you in person on the Lord’s day if you are ever in the Springfield, MO area! 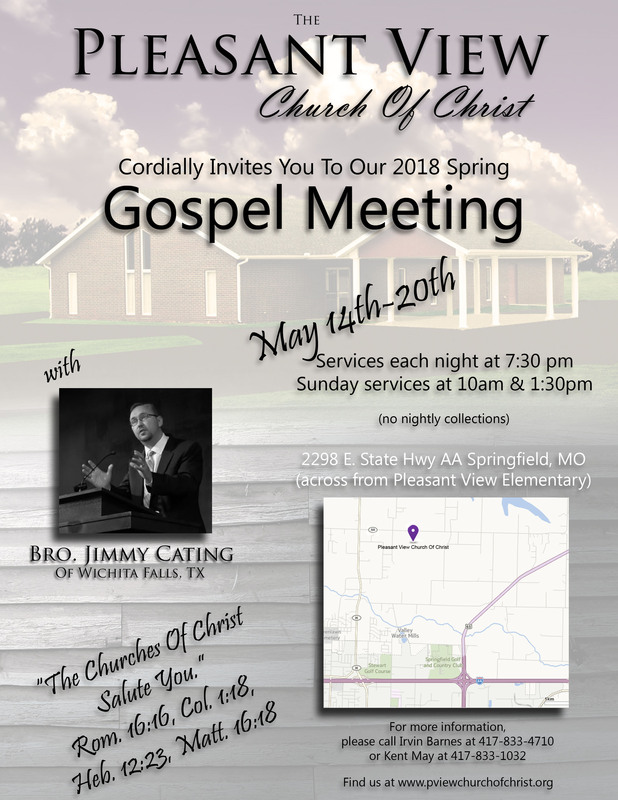 Spring, 2018 Gospel Meeting With Jimmy Cating Coming Up Soon! We are pleased to announce our Spring, 2018 Meeting with Jimmy Cating from Wichita Falls, TX is just around the corner! Beginning Monday, May 14th through Sunday, May 20th, Brother Jimmy will be holding forth nightly through the week at 7:30 pm and will be preaching for us at 10 am and 1:30 pm on the Lord’s Day services. We would be honored with your presence to hear the Truth taught plainly and with ease of understanding. Leave your wallet at home because we have NO NIGHTLY COLLECTIONS. Regardless of who you are, where you’re from, or what you believe in a religious way, we hope to see you there! Fall, 2017 Gospel Meeting Recordings Of Jerry Dickinson Added! We just completed the additions of Jerry Dickinson’s 2017 gospel meeting at Pleasant View to the website for you to listen to and share. You can find them in the ‘Audio Recordings’ tab above. The meeting was a great success and we look forward to having this fine preacher of the Gospel come see us again very soon. We were very encouraged by the support shown for the meeting by many members from surrounding congregations, as well as people visiting from the community for nearly every service! These lessons are both powerful and relevant to the time that we live in while staying true to what the scriptures have always told us through the ages. In this series of lessons, Brother Jerry took on several interesting topics that will engage you and help strengthen your faith. We hope that you enjoy the recordings and only ask that if you download and distribute (which is why these are here) that you would please, as with all of our posted recordings, credit the preacher somewhere in the meta-data or in the file name. Thanks for stopping by and we would love to see you in person on the Lord’s day if you are ever in the Springfield, MO area! Fall, 2017 Gospel Meeting with Jerry Dickinson Almost Here! We are pleased to announce our Fall 2017 Meeting with Jerry Dickinson from Texarkana, TX is just around the corner! Beginning Sunday November 12th through Sunday November 19th, Brother Jerry will be holding forth nightly through the week at 7:30 pm and will be preaching for us at 10 am and 1:30 pm on both Lord’s Day services. We would be honored with your presence to hear the Truth taught plainly and with ease of understanding. Leave your wallet at home because we have NO NIGHTLY COLLECTIONS. Regardless of who you are, where you’re from, or what you believe in a religious way, we hope to see you there! Summer, 2017 Gospel Meeting Recordings of Mike Criswell Added! We just completed the additions of Mike Criswell’s 2017 gospel meeting at Pleasant View to the website for you to listen to and share. You can find them in the ‘Audio Recordings’ tab above. The meeting was a great success and we look forward to having this fine preacher of the Gospel come see us again very soon. We were very encouraged by the support shown for the meeting by many members from surrounding congregations, as well as people visiting from the community for nearly every service! These lessons are both powerful and relevant to the time that we live in while staying true to what the scriptures have always told us through the ages. In this series of lessons, Brother Mike took on several interesting topics that will engage you and help strengthen your faith. We hope that you enjoy the recordings and only ask that if you download and distribute (which is why these are here) that you would please, as with all of our posted recordings, credit the preacher somewhere in the meta-data or in the file name. Thanks for stopping by and we would love to see you in person on the Lord’s day if you are ever in the Springfield, MO area! Summer, 2017 Gospel Meeting With Mike Criswell Nearly Here! We are pleased to announce our Summer 2017 Meeting with Mike Criswell from Kansas City, MO is just around the corner! Beginning Wednesay August 2nd through Sunday August 6th, Brother Mike will be holding forth nightly through the week at 7:30 pm and will be preaching for us at 10 am and 1:30 pm on the Lord’s Day services. We would be honored with your presence to hear the Truth taught plainly and with ease of understanding. Leave your wallet at home because we have NO NIGHTLY COLLECTIONS. Regardless of who you are, where you’re from, or what you believe in a religious way, we hope to see you there!